The Acura ZDX & MDX J37 Throttle body. This very reliable OEM Honda part is very similar to the Acura TL-S throttle body with less out of your wallet. 78mm ID opening tapered down to 70mm. 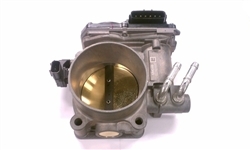 This DBW throttle body will bolt to a RBC manifold or other DBW flanged Honda intake manifold (AP2 S2000 etc.) using our P389 or P384 P2R adapter.